You can pretty much turn these into anything you'd like. You can use one picture like I did for mine (the very first photo), use multiple photos (like in the picture above), add text, choose a design, have no design...it's really up to you, and the sky is the limit. Oh, these are darn cute! Perfect for my 16 mo.old grandson. Oh my goodness this is so cute and such a lovely thing to have! Why wasn't there something like that when my son was born?! Well, IF I should have another one, I definitely want this! How sweet! Now you can watch them grow via height AND picture! Great idea! This is really adorable! You know, since I've started following a few blogs I have heard about things I never imagined existed! What I love most about this is that you can move it around easily without it getting stuck. 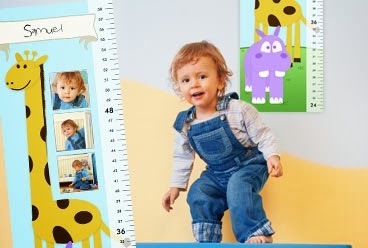 This would be great to give as a gift to parents to be--that way they could start as soon as the child stands to begin measuring him--the fact that it can be moved is a very big plus. I love this so much. I want to go and order two of them right now for the gruesome twosome. Those look so cute! I will have to look into these for my girls, I'm sure they will love them! I love these. I like how you can move them without ruining the walls. When my kids were growing up we used to have them stand against the same wall and we would mark it with a pencil and keep it there and then the next time compare and see how much they grew. I love this idea much better! Ok, that is just too cute! I hate hanging things on my walls that peel off the paint so I like that they are removable. MailPix has the best products! Such good quality too! I love how you compare his size with roller coaster rides. We do that with Allison too lol. Very cute Growing Chart! What a fantastic idea Rosey! Now that's a great idea! I would love this for my daughter! Those are adorable!! My son just asked me if we could get a growth chart, because his cousins have one. And he thinks it would be cool to track his growth. And he's NINE! So this is pretty sweet! 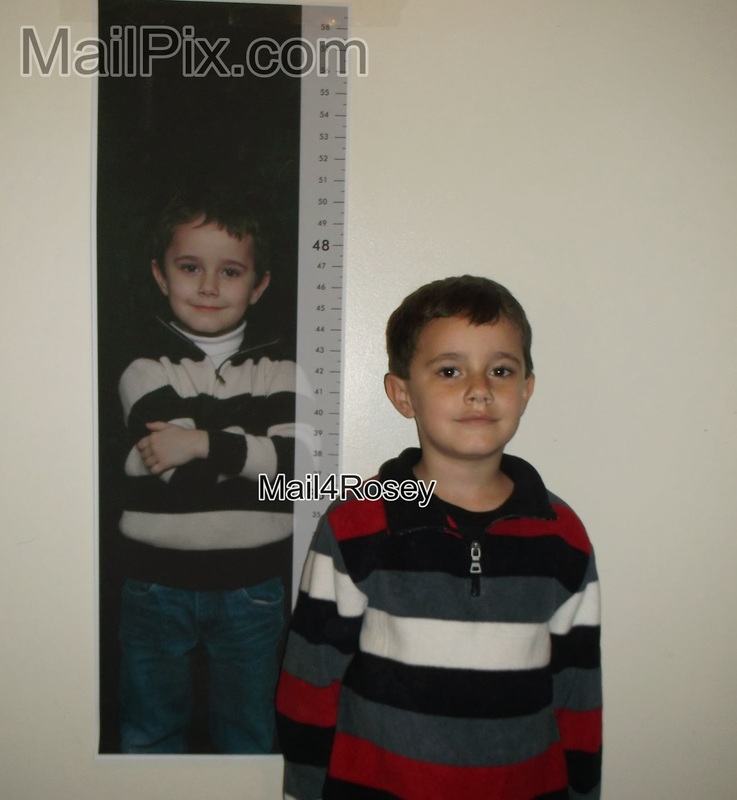 I love the idea of a growth chart because they grow so darn fast! I made the mistake of marking the milestones on a door jamb and then lost that when we moved out of that house. At least a chart like this you can take with you as a keepsake. I love this! What a great idea. Makes it so much more fun for the little one. How adorable is this? I just marked my walls LOL I wish I had had this!! I love the peel and stick feature too. Oh my gosh that is SO cute! I would've loved that for when my girls were even younger. i like that it is stick and peal. we have one that we keep taping up and it keeps falling. BUT, this one even I can be on there, lol, I'm not 5' tall yet. At 33 I'm not sure it will happen. My grandmother never made it to 5ft either. Her feet would hang if she sat on a tall chair, lol!! I like this personalized growth Chart, just a reminder for me. My little one is 3 already and we do not have any for him. Time to get one. that's awesome and makes it so fun for not only the parents, but the child! i love it! Hey that's neat that you can personalize it! I didn't know there was something like that. Fun for a memory to hold onto! That is sooo cool. I have a personalized chart for Madison that I got from PBK but it only has her name on it. This is so much nicer. Thanks for sharing. He is so cute and I LOVE the idea of a personalized growth chart. I've not heard of one personalized like this before! Pretty neat.